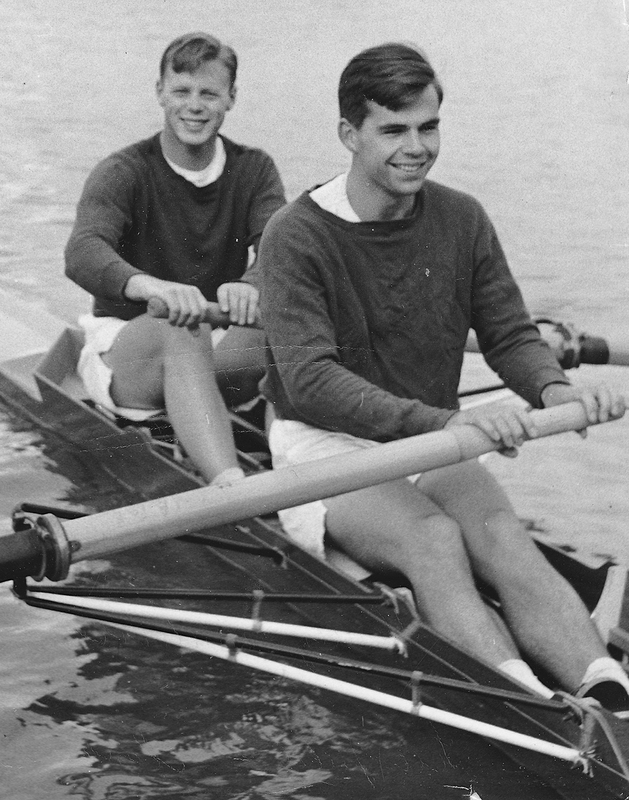 Richard Norton (bow) and Hugh Scurfield (stroke) of Hertford College, Oxford Boat Club, winners of the Silver Goblets and Nickalls’ Challenge Cup for coxless pairs at the 1959 Henley Royal Regatta. In (1958/9) we were transformed from two very average oarsmen into a Henley winning pair of internationals. It was like an impossible and unexpected dream coming true. We had both rowed at school in coxed fours without notable success. At Hertford (College, Oxford) we met up and again we were not noticeably successful. After summer eights week in 1958 we talked together about our frustration. 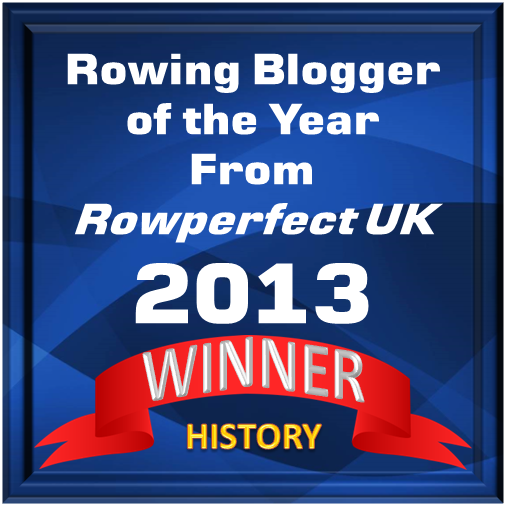 Was our rowing career over or was there still an opportunity to achieve some success? Perhaps we could row a pair or double scull? Our college and university cox laughed when we spoke to him and he scoffed “You two could never row a pair!” That was enough to set us off. We borrowed a boat and went to Oxford City and Reading regattas. We scrambled home first in each. The opposition was not high, but enough to encourage us. We got together 3 weeks before the autumn term preparing for the University Pairs. There we met and just defeated the English pair who had just won a silver medal at the Commonwealth Games. 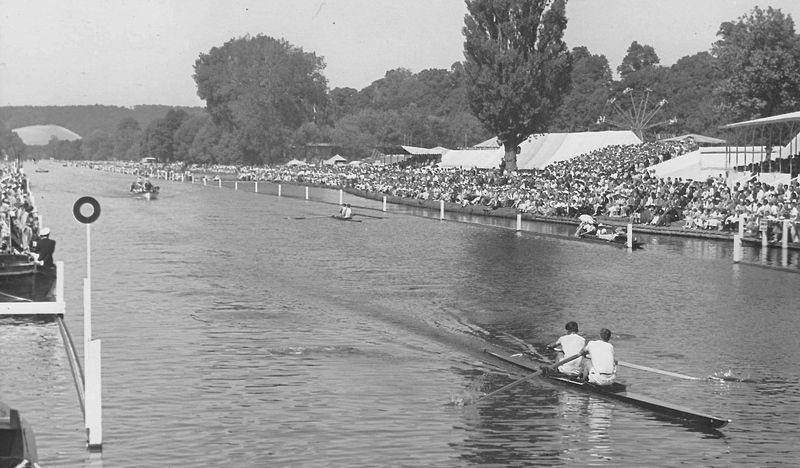 That gave us big ideas: what about the Goblets at Henley 1959? We reminded ourselves that we had not allowed the opposition to know we had been doing so much training while they had a had a good break after the Games. We should not expect too much for ourselves. I was by then in my final year and had a maths degree to work at. Our final piece of motivation was when we were told that we were not good enough for the Blue Boat. Then we knew we had to prove them wrong. Indeed in subsequent racing we defeated each of the blue boat in pairs. Training started for the Goblets in January and we rowed well over 1000 miles, including one day when we covered 50 miles on the Severn. Richard looked back at rowing books. We experimented with weight training. We ran. We did a lot of interval training. We ate enormously, because we needed to refuel our bodies. Curiously Richard put on weight while I lost it. We had a magical old coach of over 80. He was not a part of the rowing establishment but he really understood what made a boat move, and what stopped it. We tied our slides together. We rowed without slides. We took off the rudder. We listened to lots of people. Whenever we launched our boat we polished it and did some exercises; they said we were going too far! We seem to have tried everything. People, including the families, laughed at our commitment. It was suggested that it was not British to train so hard and take it all so seriously! How times have changed over 56 years. People laughed at us when they saw us walking together; we were always in step, but being a pair and not a double, my left foot would go with his right. Norton and Scurfield winning a semi-final of the Goblets after an initially tight race. Their races were noted for their exceptionally high rating, starting at around 45, rarely dropping below 38 and finishing at over 40. We found ourselves thinking increasingly together. Without pre warning we would find ourselves wearing similar clothes. Some 25 years later when we met at Hertford to give a copy of our booklet on the Goblets to the Principal, we were wearing exactly the same clothes! On the water we did the same things without either of us instructing the other. We did not need to call a spurt, we just went together. We loved training alongside other boats; it was good for learning how to react together and also good for steering. This was something that Richard was a real expert at. In all we raced at 14 events before the European Championships and we were never beaten at any of them. We learnt from all this racing. Our old coach, whom we called the Old Devil, told us to keep to ourselves our speed and tactics. At every race leading up to the Goblets we used to slow down as we got nearer the finish and the opposition would think we were slow over the second half. 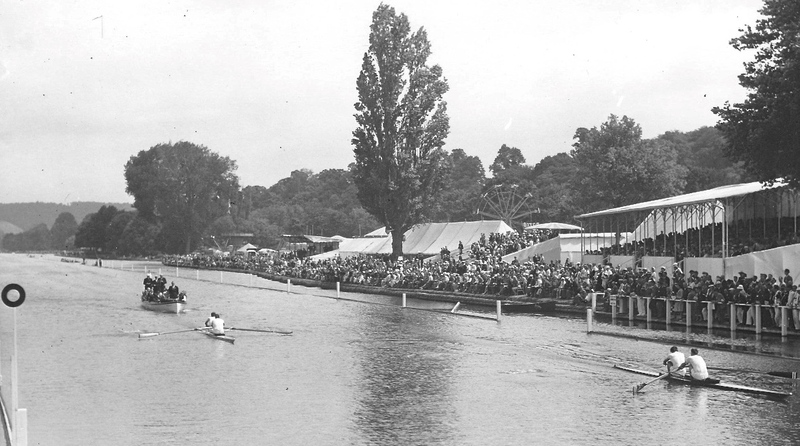 We knew we could go over the Henley course at near record speed and with very little fade. In both the semifinal and the final, the opposition thought they were going to row through us, actually the reverse happened – indeed the official verdict in the final against two internationals was easily. Norton and Scurfield beat M. Beresford and C. Porter of London Rowing Club, easily in the final. This is not the place to report on the whole racing season, suffice to say it was successful beyond all expectation until the very last day in the final of the European Championships. It is still a mystery as to why we could not reproduce our best form on that day. The first half was alright, but then we watched two crews go past and we came fourth. We felt we should have at least got the bronze if we had rowed as well as at Henley. We often have wondered why and do not have a clear answer. The conditions, stemming from a strong following wind, were not our favourite. We had changed our rig, was that sensible at such a late stage? We took the whole international regatta seriously, unlike the rest of the British team, none of whom got through to their finals. Their morale was not good and we felt unpopular with them. We seemed to be the odd ones. Our training post Henley and prior to the European games was disrupted and not ideal. I got married one week after Henley, we had our honeymoon in Copenhagen where Richard, the best man, also came so that we could row there at an international regatta – which we won! But it was disruptive and our boat took a long time travelling, thereby depriving us of training time in our boat. Whatever, we did not do our best. I now look back and I can see that we were very lucky that all went so well for us. We knew from an early stage that we were aiming to win the Goblets and nothing must distract us. We were totally dedicated. I went on rowing after 1959 for 7 years. During that time I was also learning how to work in a big Insurance company, I was training to be an actuary and leading a small rowing club, which also was to win at Henley. I was to become a director of Norwich Union, now a big part of Aviva, and president of the national body of Actuaries. I don’t think that my career would have been anything like so successful without all that I learnt from rowing in the Hertford Pair: in particular determination and dedication to a clear aim, as well as leadership, enthusiasm and the need for the fullest preparation. So I have recently come to the conclusion that without that time with Richard, I would have had a very different career. I am much indebted to him. I have recently told his family but sadly I don’t think I ever told him. Those of us who knew Richard will remember his enthusiasm, interest and serious minded determination. He would delve deeply to get the best possible answers. In the pair we experimented with cleaver oars long before they started to be used generally. He adjusted and made the rigging more efficient. We, in the pair utilised interval training and whenever we went on the water we polished the boat, to the amusement of onlookers! He would read all the experts both current and past. We experimented. He made it all sound so obvious. Collectively all the changes must have made a big difference but individually each was unmeasurable. He was very satisfying and fun to work with. There are many of us who were grateful to have known, worked and played with him.